The New Redheugh Bridge was opened 18th May 1983. Opened: 18th May 1983 by the Princess of Wales. Designer/Engineer: Mott, Hay & Anderson. Contractor/Builder: Nuttall/HBM. Traffic: Motor vehicles & pedestrian. Length: 2942 ft (897m). Width: 52ft (15.8m). 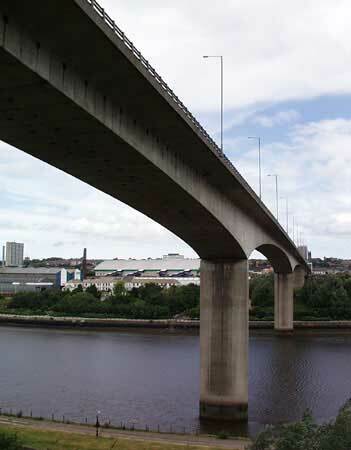 There have been three Redheugh Bridges on this site, dating back to 1871. The current bridge was opened by the late Lady Diana, Princess of Wales in 1983.